based on counting tracks in the snow. The tiger is a rare, sparsely distributed, and secretive animal that is found across at least 180,000 km2 of Primorsky and Khabarovsky Krais in southern Russian Far East. This combination of attributes makes the tiger a particularly difficult animal to count reliably. The first range-wide Amur tiger survey was organized by Lev Kaplanov at the end of the 1930s, and suggested that that only 20-30 individuals remained in Russia. Kaplanov’s survey laid the foundation for use of winter track counts as a basis for estimating tiger numbers. Full range surveys of the Amur tiger provide the only way to get a complete picture of the status of the population, its distribution and dynamics. At the same time, however, financial and logistical constraints make range-wide surveys practically impossible to conduct with sufficient frequency to effectively monitor changes in tiger abundance. Since 1995 WCS has led both organization of range-wide tiger surveys as well as development of a standardized annual monitoring program, which acts as an “early warning device” to signal rapid decreases in numbers of tigers or their prey. In the winter of 1995-1996, WCS staff helped organize a survey of Amur tigers across their range in Russia. The need for this survey arose largely out of concern over the status of the population following epidemic levels of poaching after the collapse of the Soviet Union. Results showed 330-370 adult tigers and some 100 cubs remained in Russia. In 1998 and 1999, WCS led a team of Chinese and Russian biologists on the first internationally- organized survey of tigers in China’s Jilin and Heilongjiang Provinces. These surveys suggested that only 7-15 tigers remained in Northeast China. No evidence of reproducing females was found, suggesting that survival of the Chinese population was dependent on emigration from Russia. Disappointing as these surveys seemed, they provided the foundation for creation of China’s Hunchun Tiger and Leopard Reserve and plans for the recovery of tigers in Northeast China. The most recent range-wide survey of the Russian Amur tiger population was conducted in 2005, with WCS as lead coordinator. Working with an alliance of governmental, non-governmental, and research agencies, WCS secured Russian governmental support for the survey; developed survey methodologies and protocols for data collection; organized and implemented database management, and secured funding for this massive operation. During the 2005 winter, fieldworkers traversed about 26,000 km on foot, skis, snowmobile and car to log the exact location of tiger tracks. Results of the survey put Amur tiger numbers at an estimated 334-417 adults and 97-112 cubs. 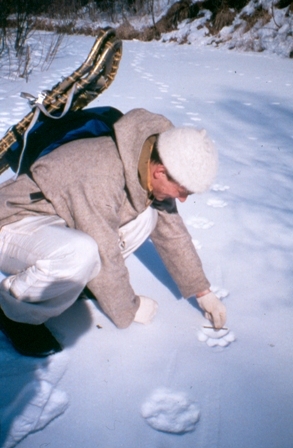 Beginning in the winter of 1997-1998, WCS together with numerous partners has organized annual monitoring of the Russian Amur tiger population using standardized survey techniques. The Amur Tiger Monitoring Program includes 16 monitoring units dispersed across the entire range of tiger habitat, totaling 23,555 km2 (approximately 15-18% of suitable tiger habitat), which are surveyed to assess changes in tiger numbers, cub production, relative prey densities, and changes in tiger habitat. A total of 246 survey routes are sampled twice each winter, representing 6114 km traversed in total. 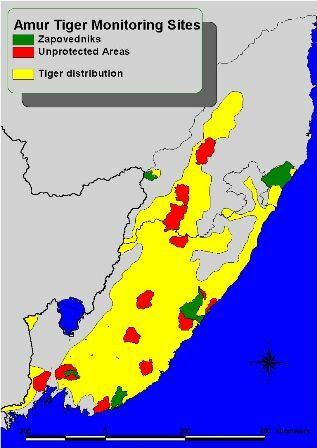 This monitoring program provides a statistically sound basis to assess trends in populations of tigers and their prey, and thus serves as a means to evaluate the effectiveness of conservation and management activities.